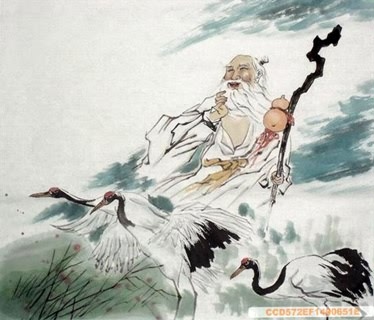 Since ancient times in China the crane has been regarded as an auspicious bird, next only to the legendary phoenix among all the birds with a divine poise. It was also a symbol of longevity and incorruptibility. Because a crane was considered the top-ranking bird, it was used as Imperial China's highest demarcation of court status, and its appearance on the rank badge of an official's robe signed that the wearer was a civil servant of the first, or highest, rank. 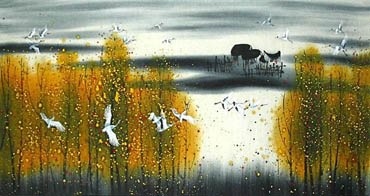 Chinese Lotus & Cranes Painting: represent a wish for peace and harmony. 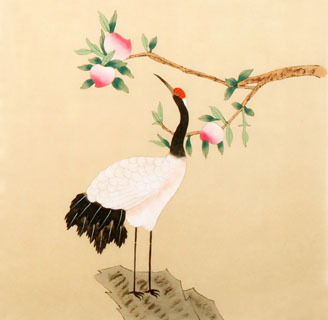 A Crane Surrounded by Peonies Chinese Fengshui Painting: can be interpreted as yipin fugui (一品富贵), "May you be wealthy and prestigious with the top official rank." 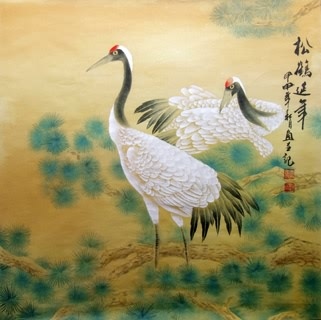 Chinese Ascending Flying Cranes Feng Shui Painting: represent the blessing yipin gaosheng (一品高升), where the yipin (number one [birds]) are depicted rising to a high position (gaosheng 高升). 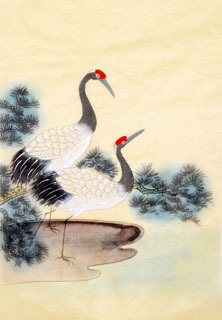 Chinese Pine and Crane Painting: together express the good wishes of longevity to old couples. It is symbolic of becoming an immortal as well in general. Sometimes, an elder is added in this combination. 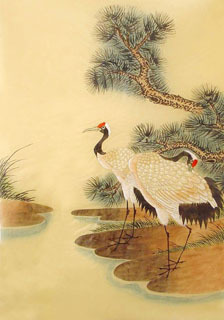 Chinese Deer, Firmiana & Crane Fengshui Painting: 鹤鹿同春. Crane combine with deer and firmiana emerged as an auspicious picture that used as birthday presents for elders, conveying the wish of longevity. 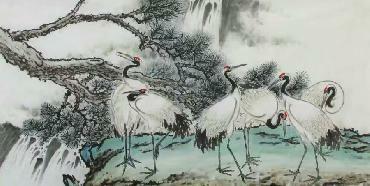 Chinese Crane, Rock & Rising Tide Fengshui Painting: 一品当朝. The crane is usually depicted standing alone on a rock which is surrounded by rising tide, which represents attaining the highest civil rank. As chao means both "tide" (潮) and "government , dynasty, or having an audience with an emperor" (朝). Thus, a crane standing before the tide represents a top-ranking minister standing before his emperor. Even the standing alone (duli 独立) is a rebus for another duli (独力), which means "having attained something by one's own efforts," the reference being to the succcessful minister having attained his rank through his diligence at his studies, which enabled him to pass the civil service examinations. 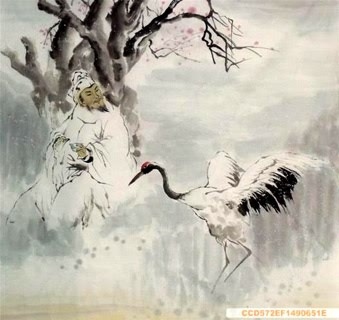 Chinese crane, clouds, the fairyland in penglai, and the Jade Terrace Fengshui Painting: 海屋添筹. There is another lucky pattern relate to crane, which is composed of both landscape and buildings: a crane, clouds, the fairyland in penglai (蓬莱 the famous island abode of the Immortals), and the Jade Terrace (yaotai 瑶台, another realm of the Innortald). Its meaning is "foundation, enterprise, or family estate that built by the founder is firm and would built to last. " InkDance Price: USD 440 /GBP 361 /EUR 418 Sold, you can customize it. InkDance Price: USD 371 /GBP 305 /EUR 353 Sold, you can customize it. InkDance Price: USD 356 /GBP 292 /EUR 339 Sold, you can customize it.